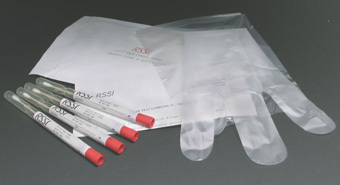 RSSI's Sealed Source Leak Test Kits include a testing swab, a pair of gloves, an information sheet and instructions, a return mailer (postage supplied by customer), and analysis and results transmittal. Results can be sent by mail, email, and/or facsimile. Reminder stickers are included with mailed results. Analysis of leak test kits is authorized by our license, IL-01429-01, for domestic clients and is approved by the Canadian Nuclear Safety Commission, meeting the criteria and requirements of R-116, for Canadian clients. Please call 847-965-1999 if you are paying by purchase order. For a sample report, please go here. If you need a fillable leak test information sheet, please go here.